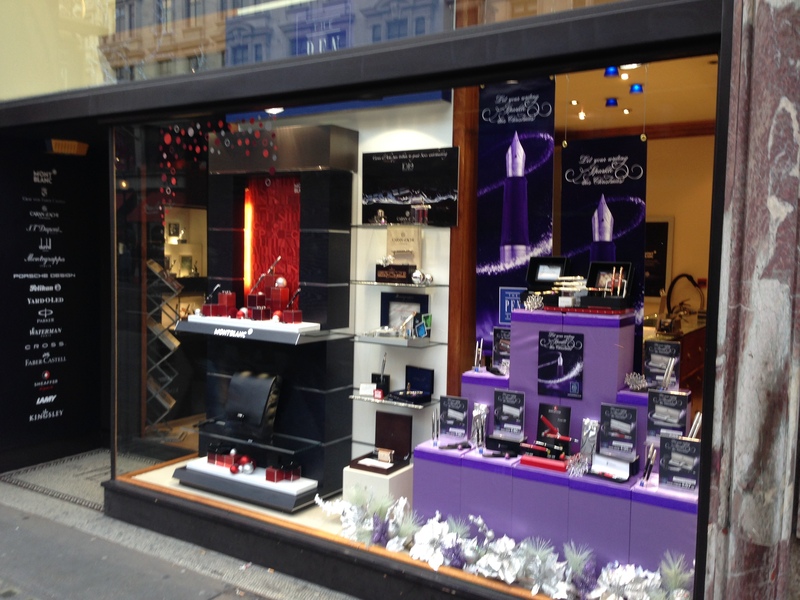 I was approached by The Pen Shop, Europe’s largest luxury pen and gifts specialist, to provide design and display advice and hands-on visual merchandising services for their 20 retail outlets across the UK. To enhance The Pen Shop brand identity and seasonal marketing campaign I re-designed the Christmas decoration scheme for each of their 20 stores and concessions. I sourced, purchased, assembled and distributed seasonal props for all of their window and interior displays nationwide. As a cost effective solution I refurbished existing decorations where appropriate, bringing them up to date with a new style and colour scheme. For the premium locations and flagship store I designed and manufactured bespoke decorations to suit the luxury brand and locations. Liaising with the Store Managers I provided hands-on support, visiting the retail outlets across the UK to install the window displays and rework the interior layouts in 2013, 2014 and 2015.